TALA blends the semiautobiographical story of a gay, Korean-Chilean playwright living in America with the tale of Pepe and Lupe, two lovers inspired by Chilean poets Pablo Neruda and Gabriela Mistral. This surreal tragicomedy delves deep into the absurdities of being an artist while trying to write within the margins of so many broken systems. 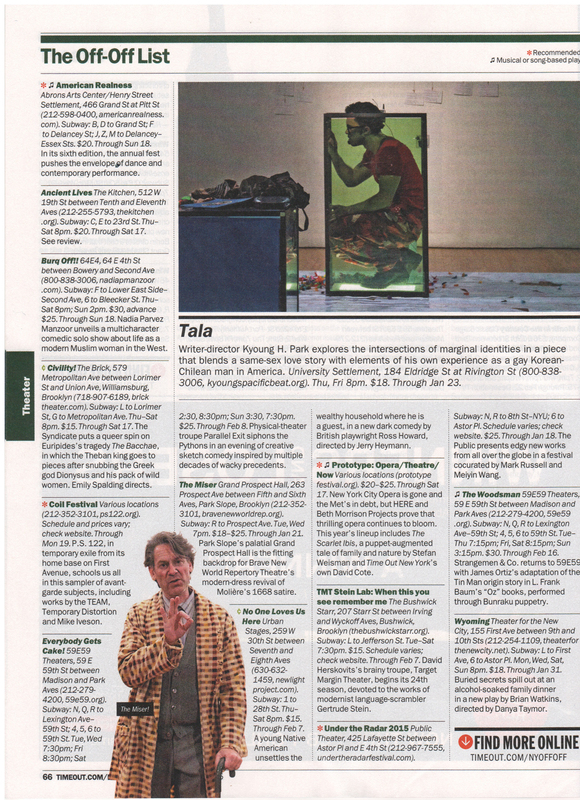 TALA is a Time Out NY Critic’s Pick! 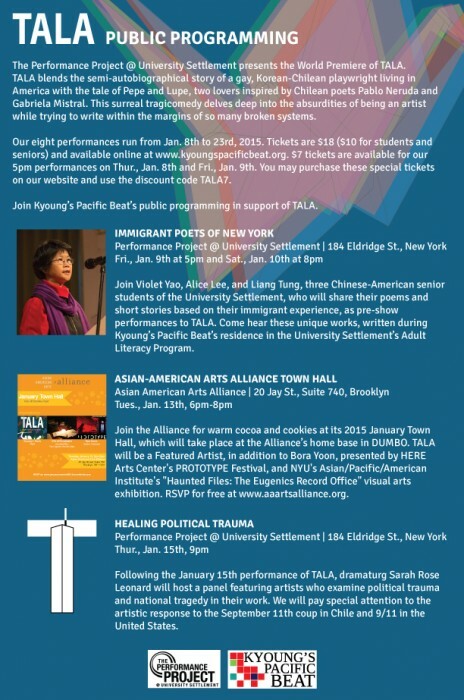 Read more about TALA in Kyoung’s interview with New York Theater Review. Read more about Kyoung in Theater in the Now. Learn more about our Immigration History Timeline, featured in TALA‘s production. TALA was written under the mentorship of Lee Breuer with support of an Artist grant from the Vermont Studio Center. It was later developed at the Ma-Yi Theater Company and Lark Play Development Center, and workshopped at HERE Arts Center and Columbia University’s New Plays Now 2012 at the ToRoNaDa Theater (all New York City). The workshop production of TALA was produced by Amanda Crater, with dramaturgy by Keren Toledano. 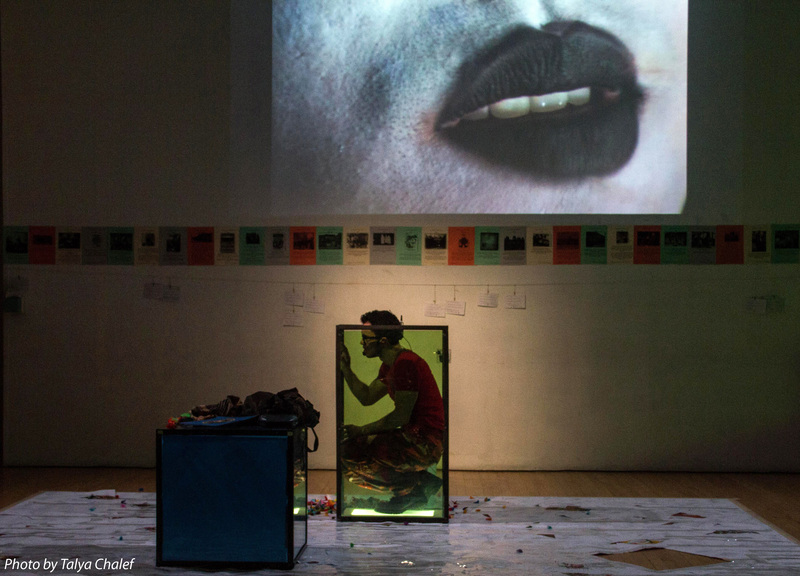 The World Premiere of TALA will be presented at the Performance Project at University Settlement (New York City) as an Artist-in-Residence project with support from a Foundation for Contemporary Arts Emergency Grant.